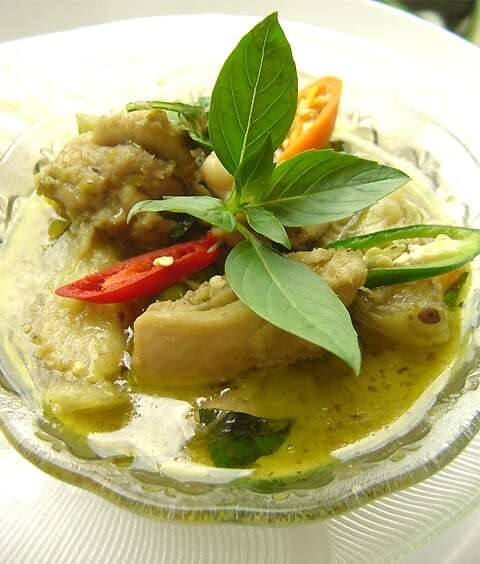 A favorite dish in thai restaurants around the world, geang khiao wan gai means “green sweet curry”, the sweetness deriving from the coconut milk and palm sugar. It is also deliciously hot and aromatic thanks to the green chilli, peppercorns, kaffir lime leaves, and sweet basil, and salty through the shrimp paste and fish sauce. Heat the coconut cream in a medium saucepan over a low heat. Add the green curry paste and stir, cooking for about 4-5 minutes until the green curry paste oil separates and rises to the surface. Add the kaffir lime leaves and the chicken slices to the pan. Cook, stirring, for 2 minutes then add the fish sauce, palm sugar, coconut milk and the thai aubergines. Boil (uncovered) for a further 7 minutes until the chicken is cooked, stirring often to prevent sticking and burning. Add the sliced chillies and basil, stirring together for about 1 minute. Serve the curry in a bowl, garnished with 1 tablespoon of coconut cream and the reserved basil leaves.